The objective of this post is show as make a keyboard without a numpad from a conventional and complete computer keyboard. The original post was written in Brazilian Portuguese and is at http://eriberto.pro.br/blog/?p=1050. Though the post is in pt_BR, has several images showing all process. So you can understand the pictures and make your keyboard too! We will strip the numpad using a hacksaw. You will need a keyboard with the control and the leds out of the area will be cutted off. 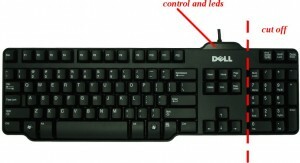 A great example are the Dell keyboards, as can be viewed in the image bellow (click to enlarge). However, we have thousand of similar keyboards in the world. If you have comments, doubts or ideas, please, write here in English. Use the reply area bellow. Lemuel, not yet. But you can understand the all process looking the pictures. Send me your questions.